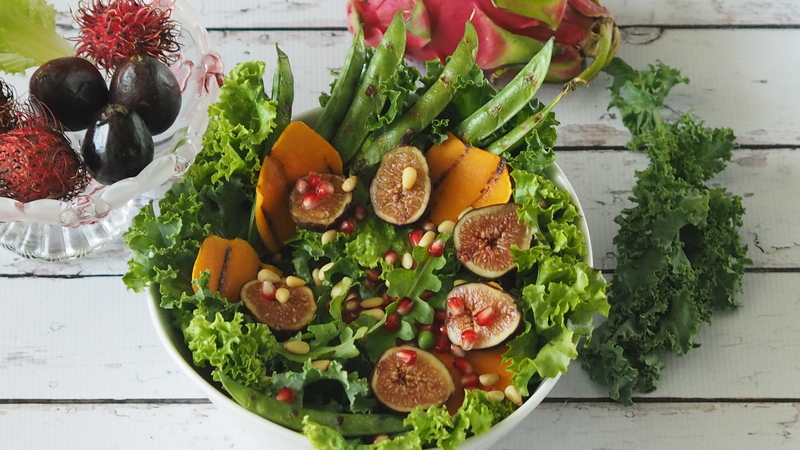 Fig Salad with kale, lettuce leaf, pomegranate. For first time I found figs in local market. Not sure when and where but last time I bought and tried figs didn’t leave good taste. Maybe they were not enough ripened or I am not supposed to eat at that young figs. I was skeptical to buy. This time I went ahead anyways to take chances. Man… they were so good. They were sweet enough to eat by themselves. After eating few, thought of making few variations. Then there it was – Fig salad. I tossed kale, lettuce leaf, some left over butternut squash, pomegranate, pine nuts. I visit local market quiet often. Maybe because vegetables and fruits sold there are not from cold storage, I find them natural fresh and tasty. They don’t stay fresh long enough as the ones from grocery store. That’s one of the reasons I like them because something which keeps them fresh for long is not added. Not sure if it is wax or stored in ethene to ripe them. Remove peas from pods. Chop butternut squash into wide cubes. Steam or grill butternut squash and peas. Combine all dressing ingredients in bowl. Whisk or mix with spoon. Other fruits in the photo are figs, orangutan fruit(spiky ones) and dragon fruit.